Table linens are a simple sewing project that are well worth the effort. These small pieces of fabric artfully arranged add pop, sizzle, glamour, elegance and just plain fun to an otherwise ho-hum table. They are quick and easy to make and the choices are as endless as the selections at the fabric store. So have fun and be boldly creative! Begin by cutting out a large square. Determine the width of the hem and miter the corners to suit. My favorite size is 21″ x 21″. To create the mitered corner remove 3 1/4″. Turn under 1/4″ all around the perimeter of the square as shown below. Bring folded edges together at mitered edge and stitch a 1/4″ seam. Clip threads and trim corner to stitching line to ensure a crisp point. Press open and complete on each of the four corners. Turn each corner and carefully press hem into place. Stitch hem into place. You may wish to decrease stitch length for added strength at the corner seam lines. Once stitched, your napkins is completed. I’ve had this fabric for a very long time. It’s a fabulous piece of delicate voile in a natural creamy color with a classic fleur-de-lys gold print. I have never known quite what to do with it , but knew it had to be something elegant and special. Today I found its purpose and began cutting. Not long ago while on my lunch hour, I stopped in to have a look round the Quilted Forest. I’ve never been much into quilting, but I do find tremendous inspiration in the beautiful fabrics I see there. People are so talented and it’s always exciting to see what interesting ideas others come up with. While shopping I came across a charming collection of fabrics that included an adorable hedgehog. I was told that hedgehogs are “really in” … something I never would have known, but for being told. I had to have the hedgehog fabric! I picked up two additional companion pieces and some jumbo rickrack that seemed to go with it. I had no particular idea in mind, but thought perhaps it would make a cute little dress… if I could find the right pattern. Over the next couple of months I did find a suitable pattern and was ready to go once I could find a block of time to work. With today being a holiday I set out this morning to see what I could come up with and here we have it. The biggest challenge, was to determine which pieces to use where. I wanted the hedgehogs to play a prominent role in the design so I used that fabric for the back because it was in one piece and would thereby show off the fabric to full advantage. Then decisions were made about the piecing across the front. It’s surprising how placement makes such a difference in the overall look and feel of a garment, but it really does and therefore requires careful consideration. Being a wrap dress, there are interior ties to help hold the dress in place. Once the dress was finished the rickrack was applied around the bottom. Overall, I am pleased with the way it turned out. The scale is a bit large for a child, but with the jumbo rickrack, I think it works. I like the versatility of the pattern; I can see this with tights and a turtle neck for a Christmas dress or as a warm weather sundress. Either way it’s adorable. Take a look at this wonderful ad campaign from the 1950’s from PatternVault. The designs are delicious! I’ve been following “Looking Good Girls” for a while now and the long-legged beauty responsible for this blog never fails to intrigue and amaze me with her wonderful sense of style and ability to put together an amazing look on a dime. For High Fashion on a budget check out lookinggoodgirls.com She is a breath of fresh air! Played dress-ups for church today, pairing a blue Garfunkle dress with a bubble-gum pink leather jacket. I was hanging out to wear these embellished beige platforms so I started with them and worked the rest of the outfit around them. These jewel-encrusted babies were a super bargain a couple of years ago from a Nine West factory outlet. I scored this Garfunkle ruffle dress for $3 in an op shop on holiday last week. Thrift shops can be scary looking at first glance (I think I’ll never find anything in all the junk) but if you roll your sleeves up and start rummaging I guarantee you’ll find something great. 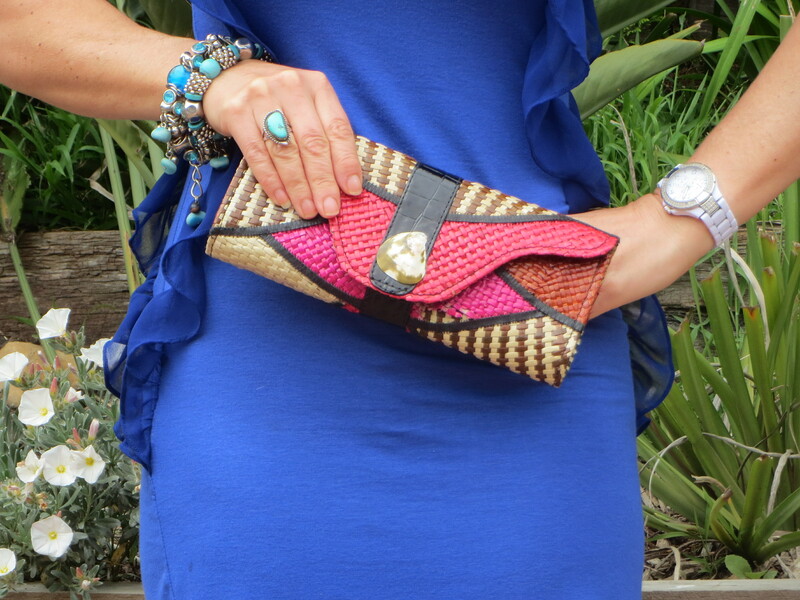 Capped the outfit off with this bright pink faux-leather jacket, colourful raffia clutch, and some turquoise-stone accessories to match the heels.